Long Beach, CA – October 15, 2012 -- It took 6 years after her bid for City Council for Gerrie Schipske, a Registered Nurse Practitioner and former EMT who did ride alongs with the Long Beach Fire Department, to get the VIAL of L.I.F.E. fully implemented in the City of Long Beach, but now that the City has announced it is taking it city-wide, Councilwoman Gerrie Schipske is very pleased. “As someone who has worked in our local emergency rooms, I thought it was important to find a way residents could communicate their medical conditions and medications to the paramedics when they responded to a call for service,” explains Schipske. “When I walked door to door in the 5th Council District in 2005, I handed out my own ‘Vial of LIFE’ kits that my volunteers and I put together. They were a hit. 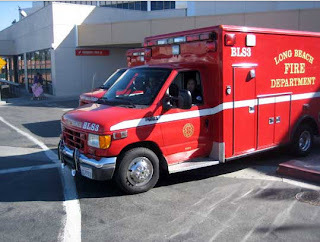 So after my election I worked with local medical facilities, the Long Beach Fire Department and several charitable organizations to improve the program and make it work for Long Beach,” Schipske notes. The Vial of L.I.F.E.is a nation-wide effort to put medical and prescription information into the hands of first responders. L.I.F.E. stands for Life Saving Information in Emergencies. The program is simple. Residents fill out a medical information form and place it inside a pill vial, place the pill vial in the top shelf of the refrigerator and put a magnet on the outside of the refrigerator to let paramedics know the information is inside the refrigerator. Click here to see brochure. Schipske reports that “senior and youth volunteers” assemble the kits which she has worked to distribute the Vial of LIFE throughout the City of Long Beach. “We have distributed 3,000 VIAL of L.I.F.E. kits to date. Any resident of Long Beach can pick up a VIAL of L.I.F.E. kit at the locations on the list to the right.” Additionally, 300 VIALS were given to Meals on Wheels for their clients. Thanks to the hard work of my office and numerous teen and adult volunteers, we have assembled and distributed over 1,000 VIAL of LIFE emergency kits. The VIAL of L.I.F.E. program is a nationally recognized program that has been in use by hundreds of fire departments for over 35 years. Now it is being provided to the residents of Long Beach. The concept is simple: provide a way to put important medical information into the hands of emergency medical services (EMS) personnel as quickly as possible so they can know the medical illnesses, medications, and allergies of those who have called for their services. Everyone has a refrigerator, so why not place the medical information in a pill vial (bottle) and place it inside where it can be found easily? A magnet (or sticker) on the front of the refrigerator (and on the front door of the residence) alerts first responders that the vial can be found inside. The medical information form provides emergency first responders with the resident's contact information, current medical conditions, medications and other vital information that can be used to quickly and correctly assess what needs to be done. Residents are encouraged to update their medical information form as often as their medical information changes. (LONG BEACH, CA; May 29, 2012) – Imagine that you are home alone when you begin experiencing chest pain. You call 9-1-1 and then collapse. Paramedics come to your home but you are unable to give them the information they need about your medical history and your medications. They notice a magnet on your refrigerator that tells them you have a “VIAL of L.I.F.E.” inside the refrigerator. They find the vial and the important information they need. Beginning May 31st, Long Beach residents will be able to use a “Vial of LIFE (Lifesaving Information in Emergencies)” thanks to the efforts of Fifth District Councilwoman Gerrie Schipske and her partnership with St. Mary Medical Center, the Long Beach Firefighters Association, Walmart and Seaside Printing. The Vial of L.I.F.E program (Lifesaving Information for Emergencies) will enable Long Beach firefighters and paramedics to have quick access to medical information as they administer critical help to an injured or sick person during a 9-1-1 call. A sticker on the residents’ front door and a magnet on the front of the refrigerator, alerts first responders to look inside the refrigerator for medical information. This information is stored inside a large prescription bottle that is placed on the top shelf of a patient’s refrigerator door. In addition to a completed medical form describing a resident’s personal medical history and medications, the vial can contain other essential information such as copy of identification. Schipske points out that the refrigerator is used because it is centrally located and common in all homes. The Vial of L.I.F.E will be introduced to the City of Long Beach during the Senior Safety Fair at the St. Mary Medical Center on Thursday, May 31st from 10:00 am to 2:00 pm, located at 1055 Linden Avenue, Long Beach CA 90813. A booth will be set up at the Parr Health Enhancement Center to provide easy, practical information on how to use the Vial of LIFE. “St. 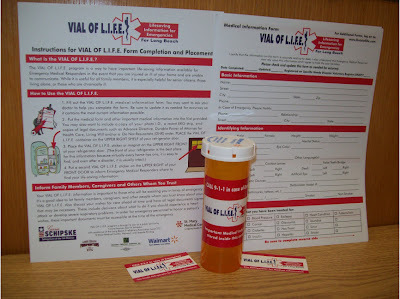 Mary Medical Center decided to help launch VIAL of L.I.F.E. with me after their CEO, Tom Salerno, went on a paramedic ride-along and saw first-hand the need for such a program,” says Schipske. “St. Mary Medical Center is adding the Vial of L.I.F.E. initiative to their Emergency Preparedness program for senior residents in Long Beach. I am excited to have St. Mary Medical Center team up with us on this important program.” Schipske notes that the medical information form used for VIAL of L.I.F.E. was reviewed by the St. Mary Medical Center Emergency Room Director, Dr. Stephen Shea. Schipske adds that several other organizations are stepping forward to help launch VIAL of L.I.F.E. for Long Beach, including: Walmart, which has provided 1,000 large pill vials (bottles); the Long Beach Firefighters Association (Local 372) which is paying for a portion of the costs of printing labels and magnets; and Seaside Printing Company which is providing printing services. VIAL of L.I.F.E. kits include: a large pill vial, instruction sheet, medical information sheet, refrigerator magnet and a sticker to be placed on front doors. “VIAL of L.I.F.E. kits will be available at St. Mary Medical Center Senior Services at 1055 Linden Avenue, and the 5th Council District Neighborhood office at 2760 N. Studebaker. For more information, go on line to: www.lbvialoflife.com or contact the Office of Councilwoman Gerrie Schipske at district5@longbeach.gov or by telephone: 562 570-6932. The VIAL of L.I.F.E. is Lifesaving Information For Emergencies. It's a place for you to store important medical information that emergency medical personnel (firefighters, EMTs, paramedics, and hospital staff) need in a time of crisis. The VIAL of L.I.F.E. Program is designed to speak for you when you are unable to speak for yourself. The information contained within the vial will provide pre-hospital and hospital providers with essential details that will aid in providing appropriate medical treatment. The VIAL of L.I.F.E. contains much of the medical history needed by the responding emergency personnel, such as existing medical conditions, allergies, medications currently being taken, and emergency contact information. It is very important that you keep this information up-to-date, accurate, and placed in the top right shelf of your refrigerator. VIAL of L.I.F.E. is brought to you as a public service by Councilwoman Gerrie Schipske with the assistance of the Long Beach Firefighters Association, Walmart, St. Mary Medical Center and Seaside Printing Company. Copyright 2012. Vial of Life for Long Beach. Simple theme. Powered by Blogger.